LOS ANGELES – Researchers from the Keck School of Medicine of USC are looking to technology to help deconstruct expert surgeons' robotic surgery skills so they can create an objective, standardized way to train the next generation of surgeons. Using a data recorder plugged into a robotic surgery system, the team analyzed expert and novice surgeons' movements during the reconstruction step of robotic radical prostatectomy, a common surgery for prostate cancer. The data helped the team decode surgical skills, develop a needle-driving gesture classification system and create a training tutorial. The results of their study will appear in the October 2018 issue of The Journal of Urology. "Although robotic surgery is a widely adopted minimally invasive option for treating prostate cancer, standardized training for it doesn't exist yet," says the study's corresponding author, Andrew Hung, MD, assistant professor of clinical urology at the Keck School. "In order to create a methodical, streamlined training tutorial for this main reconstruction step of the prostate surgery, we relied on automated performance metrics and observation to objectively measure surgeon performance." Using both video and movement data recorded from 70 surgeries, the study found that experts outperformed novices in completion time, instrument movement efficiency and camera manipulation. Experts also had fewer needle-driving attempts and less tissue trauma. The researchers were also able to identify 14 common needle-driving gestures, which were classified as combinations of forehand, backhand, flush-hand, overhand or underhand. Compared to standardized gestures, random sequences of gestures were associated with lower efficiency, more needle-driving attempts and more tissue trauma. The data were then used to develop a tutorial that broke the complex surgical step into smaller, discrete steps. 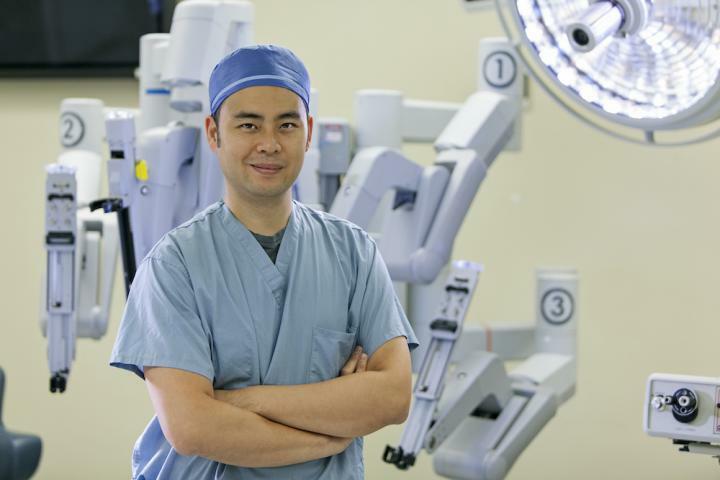 "While there is no single perfect way to do a perfect operation, creating a standardized method for robotic surgery training provides surgeons a common training ground," Hung says. Hung and his colleagues are currently testing the efficacy of the tutorial with a group of medical students in the research lab at the Keck School. The team is hopeful that their approach to developing this training tutorial could one day be applied to any procedure in any kind of robotic operation. Robotic radical prostatectomy accounts for 87 percent of prostate cancer surgeries in the United States. Founded in 1885, the Keck School of Medicine of USC is among the nation's leaders in innovative patient care, scientific discovery, education and community service. It is part of Keck Medicine of USC, the University of Southern California's medical enterprise, one of only two university-owned academic medical centers in the Los Angeles area. This includes Keck Medical Center of USC, composed of Keck Hospital of USC and USC Norris Cancer Hospital. The two world-class, USC-owned hospitals are staffed by more than 500 physicians who are faculty at the Keck School. The school has more than 1,750 full-time faculty members and voluntary faculty of more than 2,400 physicians. These faculty direct the education of approximately 800 medical students and 1,000 students pursuing graduate and postgraduate degrees. The school trains more than 900 resident physicians in more than 50 specialty or subspecialty programs and is the largest educator of physicians practicing in Southern California. Together, the school's faculty and residents serve more than 1.5 million patients each year at Keck Hospital of USC and USC Norris Cancer Hospital, as well as USC-affiliated hospitals, Children's Hospital Los Angeles and Los Angeles County + USC Medical Center. Keck School faculty also conduct research and teach at several research centers and institutes, including the Eli and Edythe Broad Center for Stem Cell Research and Regenerative Medicine at USC, USC Cardiovascular Thoracic Institute, USC Institute of Urology, USC Mark and Mary Stevens Neuroimaging and Informatics Institute, USC Norris Comprehensive Cancer Center, USC Roski Eye Institute and Zilkha Neurogenetic Institute.